I know the other day I talked about making kitchen towels but I wanted to give you a better idea of how easy they are to make and show you that fabric can make a linen towel special. 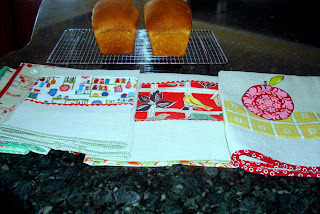 One of my ideas is to make the linen/cotton towels, wrap them in homemade bread and give them to friends/neighbors for gifts. I do make bread about once a week and doesn't everyone like fresh bread? With just plain tan linen, this strip of fabric, and rick rack placed somewhere on the towel makes it special. If you look to the right you can see I bound the towel just like a quilt. And I used left over binding from a past project. Some of the towels have patchwork binding. 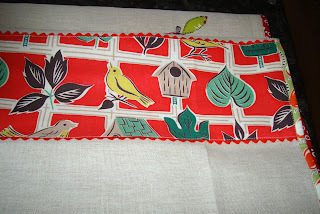 This one has 2 rows of rick rack with vintage fabric. This is a special towel because the fabric is special. I got this idea from my friend (no blog) Flora. (I keep telling her she needs a blog - she is a fabulous quilter! You'd all learn so much from her. Come on Flora, get with it!). 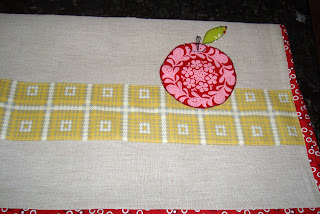 She used the Farmer's Market fabric to make a flower by fussing cutting it and I used that idea to make an apple. I machine stitched the apple with a blanket stitch and added a sketch stitched stem and a leaf that was also blanket stitched. I used a fabric stripe underneath to add extra color. Printed linen is even easier than plain - just cut and bind. As I said before I pressed the binding really well folding it over so I could machine stitch in the ditch and finish the edge quickly. More of the same. This fabric is one of my favorites. I think anyone would love an extra kitchen towel as a gift. 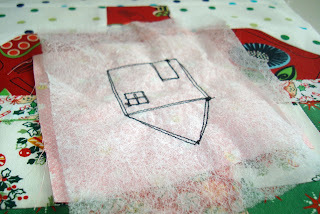 I talked before about saving dryer sheets to use with machine applique. I didn't take a picture before I tore the dryer sheet off the back but you can tell it doesn't show at all where the dryer sheet used to be. This photo from a past project shows you how to just place the dryer sheet on the back , stitch and remove - tearing it off. Simple. Okay well share with me some of your gift ideas! I've been going through my books and magazines and I have some ideas but I'd like to see what you are doing. I like things that are fairly fast to make, of course. I love the dishtowels...such a great idea! 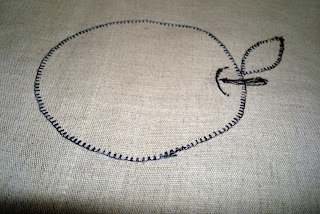 Did you still miter the corners even though your are using the "stitch in the ditch" method for the binding? wonderful Idea, I usually get Christmas plates at 75 or 90 persent off to pass cookies to the neighbors but this year I think I'll wrap them in kitchen towels. Thank you. Those are super cute. I'm going to sound like an ignoramous here (let alone not knowing how to spell ignoramous) is linen absorbent? I love dish towels and can't get enough of them. I've never thought of linen before. And speaking of gifts.... :) I've got gift ideas every day this week and next week. The towels are really cute. What a great idea. my mom's birthday is coming up...she actually asked for dishtowels. i'm going to do this for her. Thanks for the great idea's.. 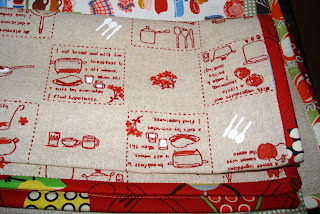 I love making dish towels for gifts but never used fabric like you did for the trim. What a cute idea Nanette! I love cute little towels. I haven't even started to think about Christmas gifts. I think I'm going to be up late a lot this year. So sad. I need to sit down with all my books and magazines too. Thanks for sharing your fun idea. Now those are a great idea!! 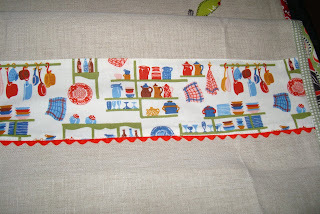 I saw some really cute dish towels in Anna Maria Horners new book SEAMS TO ME....but, they look too hard! These I can do! these towels are cute! I love the addition of the ric rac. perfect! These are all so very very special. What wonderful gifts! You are right.. who wouldn't love a fresh baked loaf of bread wrapped in one of those? That one with the birds and houses is wonderful.. but I also love your etched ones. so original and creative.. and YOU. So you just buy this linen in a fabric store? Or are they already towels? What a cute idea. I just put my bread in a brown paper lunch sack with a strip of fabric tied around it. I'm going to have to try this sometime. What a darling idea! Question: Are the towels you are using fabric or already made towels? Can I be your neighbor? I'm joining the "wants to be your neighbour" group!!! Your tea towels are great fun and will make fabulous gifts - I love the fabrics you chose, and the addition of the rick rack and/or appliques is a perfect touch! I wish I lived next to you so I could get some of that great bread and fun towels!! I'm new to the whole quilting thing so here's a stupid question for you...why do you use a dryer sheet? Thank you for sharing those. I just made some last night but I mostly applique. It is so nice to see them in a different way. The towels are a great idea. Yes, everyone love homemade bread. Such a great gift idea. What a terrific idea, thanks so much Nanette. I'm always looking for ideas that don't weigh too much (for postage overseas). What a perfectly wonderful idea! I've been making pillowcases lately - they're always appreciated and so easy to do. Not as imaginative as your idea, though. Thanks for sharing! 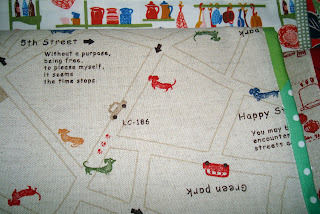 Oh, and I'm in LOVE with the wiener dog fabric - it is soooo cute! Everybody likes getting dish towels. These are definitely going on my list of gifts to make! Thanks for the great inspiration. I absolutely love the daschsund fabric - wherever did you find it? Since I still work full-time, I don't have a lot of time for homemade gifts (that will be next year! )...but thanks Nanette for this idea - I can definitely fit in some towels this year! Cheers! Well I'd like to move into your neighborhood in the hope of receiving a fresh loaf of homemade bread in a super cute tea towel. Aren't you nice! What a great idea! I wish Flora would do a blog.. wouldn't that be a fun one to read! Thanks for sharing! I can't wait for my cottages!!! I love the way you've done the binding on them. So special! thanks for more ideas on this. i have a thing for dishtowels. that's a tall order you threw out there. most of my best ideas come at the last minute. & almost have to be wrapped up quickly w/o even a pic. Hi Nanette, thank-you so much for this great idea! I love how your towels came out, simple but very pretty. I have been procrastinating on starting any gifts, been preoccupied with photoshop me thinks. I need to get off my bum. Thanks for the inspiration! Great post! Thanks so much for the inspiration!